Today is March 14th (3.14) in the third month of the year 2014 (3.14). As I hope many of you know, that is approximately equal the the circumference of a circle divided by its diameter. Since my primary role here is as a math teacher for the missionary kids, I was excited about taking this opportunity to talk with my students about circles and Pi. One of my 8th graders, Megan, and I have read a book entitled, The Number Devil, in which they talk about going to number heaven where they only eat pie. 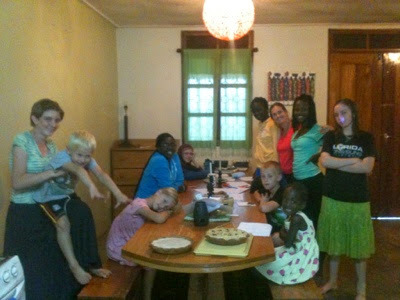 So we decided that on this day, we would make pie for everyone to eat and do some activities related to circles. Here we are at the kitchen table preparing to eat pie. As you can see, Ezra is not wanting to wait. I really enjoyed the day, helping the students test many different circles, measuring the diameter with a piece of string and then measuring to see how many times that would go around the circle. A little over 3 every time, for every circle. 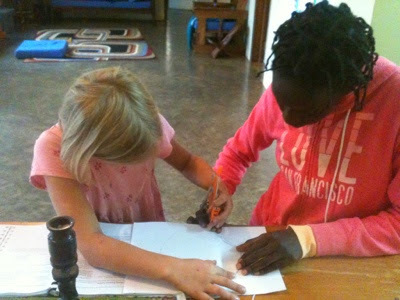 Then I had the students begin counting the circles they found in everyday objects. In my living room and kitchen they were at 432 when it was break time. Some students also made really neat designs using circles. 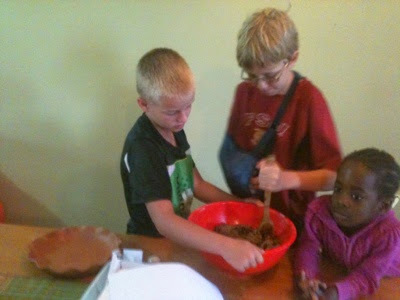 They also helped make a pie. We had a fun day and I even read to them an excerpt from The Number Devil. Days like today remind me how much I love teaching math, and particularly in our flexible school with children of many ages working together. We even got to work by candlelight for a bit while the power was out. I hope you all have a happy Pi day and enjoy marveling at the God who created this world, circles and all.